After a catastrophic event changes 19th century Japan, Korea, and China, two young soldiers must protect their peaceful island home from a warlord’s oncoming forces and newly mutated creatures that threaten to destroy the world as they know it. Hana and Kenichi are too young to remember The Great Wind, a catastrophic event that devastated 19th century China, Korea, and Japan. In the aftermath, survivors found refuge on a place where differences were forgotten and a unified society was formed. 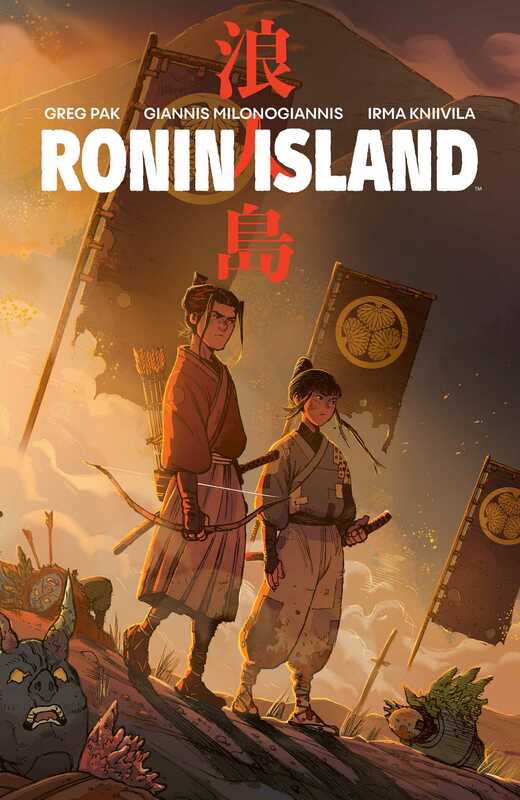 Ronin Island became home to a new generation, raised for a better future. When the Shogunate of old comes back to power, demanding a return to the old ways of life, Hana and Kenichi must prepare to defend their home and all it represents. But the warlord’s forces are no longer the most dangerous threat on the mainland as a horde of mutated creatures, remnants of the Great Wind, seek to destroy what’s left of the living world. As war comes to the island, the young samurai must face the hardships of battle and decide how far they’re willing to go for what they believe. Written by bestselling author Greg Pak (Mech Cadet Yu, The Hulk) and beautifully illustrated by Giannis Milonogiannis (Old City Blues, Prophet), Ronin Island explores an idealistic coming-of-age story against the backdrop of a morally grey time of war where the reasons for fighting are questioned at every turn.